My review of the FTD classic album release He Touched Me as featured in Keith Flynn's The World Of Follow That Dream book. Since my latest post nearly two years ago, on January 8, 2015, some 25 new albums and books have been released by Follow That Dream (FTD), the official Elvis Presley collectors label. Now, Elvis recordings specialist Keith Flynn has completed a 1,200 pages, hardbound three book set, chronicling every release by FTD from the start in July 1999 up until September this year. A total of 189 releases. And I’m proud to have been a small part of the project. Earlier this year I received an e-mail from Keith Flynn, asking me if he could use five of the FTD reviews I had written on my blog for an upcoming project. 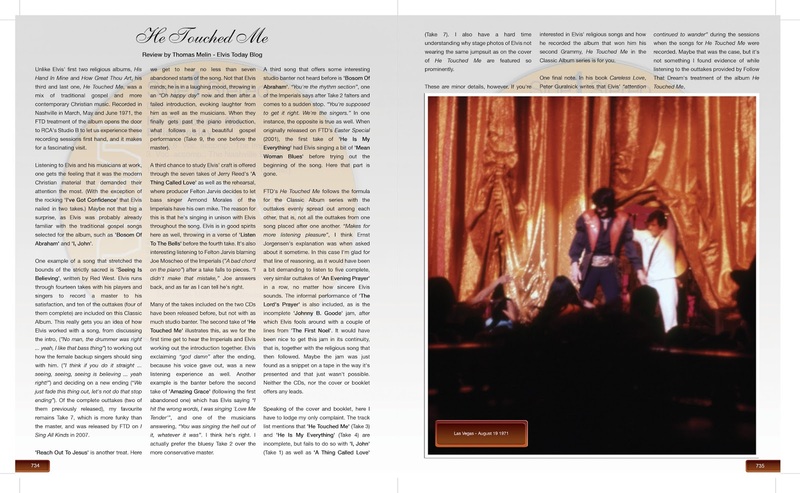 Being familiar with Keith´s impressive Elvis Presley website and his part in the Ultimate Elvis – The Complete And Definite Recording Sessions three volume book, I was delighted to say yes. With a new job around the corner and another baby on its way, I then kind of forgot about it. Until this October, when I read on the Elvis Files Facebook group about a three book set titled The World Of Follow That Dream chronicling ever release by FTD, by Keith Flynn & friends. I then remembered him asking permission to use a couple of my reviews and asked him if any of them was included in the book. When he answered that he had indeed used them I was thrilled, especially since it looked like a really beautiful package. Keith then did a nice thing, sending me the pages from the book featuring my reviews as pdf:s. I thought the layout was neat and it was pretty cool to see my reviews getting new life this way. I also imagined them being read by fellow fans from around the globe, and that was a good feeling. Before signing off, I’d like to recommend an interview with Keith Flynn about his book on The Elvis Information Network website.